How today’s pumps address these challenging conditions. While onshore fracking in the U.S. remains front-and-center, numerous analysts are predicting strong growth for the Gulf of Mexico in the year ahead. A number of historic firsts, including Shell’s Appomattox and Chevron’s Anchor, could set the stage for years to come and trigger a new wave of offshore “mega-investment” in the Gulf. These new plays venture into Jurassic-age sands, which some believe represent the final frontier of deep-water development. If these massive new projects produce as expected, then mergers and acquisitions (M&A) activity in the Gulf is expected to pick up as larger players sell maturing assets and focus on new priorities. This shift is like the trends in the Permian Basin, where larger players have shed noncore positions to target “low hanging fruit.” If things play out as expected in deep-water Jurassic-age sands, then a new round of consolidation and migration could leave behind scores of maturing wells—which could create a renaissance for enhanced oil recovery (EOR) activities. While new oil discoveries always grab headlines, EOR is much like the understudy that plays a behind-the-scenes but vital role. For most well sites, EOR activities recover up to half of the available oil and gas trapped in a reservoir. This adds up to billions of barrels that have already been discovered yet are considered too difficult to recover or not worth the effort when more attractive opportunities exist elsewhere. When a new well is initiated, the first phase (primary recovery) is aided by immense natural pressure in the reservoir, which pushes oil and gas to the surface. This primary recovery stage is efficient and profitable, but it is also limited because easily extracted product in most reservoirs accounts for just 10 to 20 percent of the total contents. The secondary recovery phase requires high volumes of water (or gas) to be injected into different parts of the reservoir. This displaces oil residing deeper in the reservoir and drives it toward the well head, where it can be extracted. Secondary recovery typically produces 20 to 40 percent of a reservoir’s contents, but this still leaves almost half of the resources untouched. The third and final phase of recovery is EOR. This requires a mix of gas, chemical and water (or steam) injections to move a reservoir’s remaining contents toward production zones where they can be extracted. EOR activities typically begin by drilling long-reach injection wells into a reservoir. Thermal EOR activities send steam down the injection wells into the reservoir to transfer heat into cold and heavy oil, which reduces its viscosity and makes it more mobile. Nonthermal EOR activities pump a mix of different gasses (carbon dioxide or hydrocarbon gas) through the same injection wells. When gas mixes with trapped oil, it causes the oil to expand and dissolve from the reservoir rock, allowing it to move freely within the reservoir, where it can be extracted. Typically, gas injections are alternated with water injections, to help sweep oil toward the production zone. But water and gas alone cannot sweep an entire reservoir, especially rocky formations. Throughout the reservoir’s life cycle, water-flood processes capture less oil per barrel of water injected. To reach the hardest parts (where much of the product remains), different polymers and active agents are required. These chemicals are metered in specific doses via metering pumps. Chemicals known as surfactants are pumped into the reservoir to lower the surface tension between oil and the rocks trapping the oil. These chemicals improve the wettability of porous rocks and allow water (infused with other chemicals) to flow through the rock to displace oil. Once dispersed, oil droplets still need to be extracted. This is accomplished by metering different combinations of polymers, which thicken the water-flood injected into the reservoir. Certain polymers work like a squeegee on a windshield. 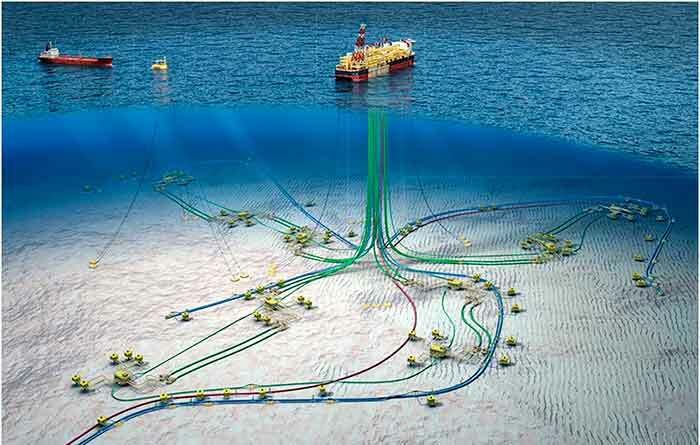 They push oil droplets together into larger bunches, which can then be swept toward production zones and extracted. Much like traditional upstream oil and gas production, a wide variety of corrosion and scale inhibitors must be dosed via metering pumps to provide a layer of protection on the well tubing and to prevent damage and rusting. During the winter months, methanol injections are required on all EOR injection lines to prevent freezing. The formation of hydrates is a critical safety issue that must be continuously addressed. Hydrates form when light hydrocarbons and water mix under high pressures and low temperatures. They restrict flow and can damage equipment. Because remediation is time-consuming, expensive and dangerous to people, equipment and the environment, flow assurance chemicals like methanol, delivered via metering pumps, are critical to keep the entire enterprise operating. Image 2. 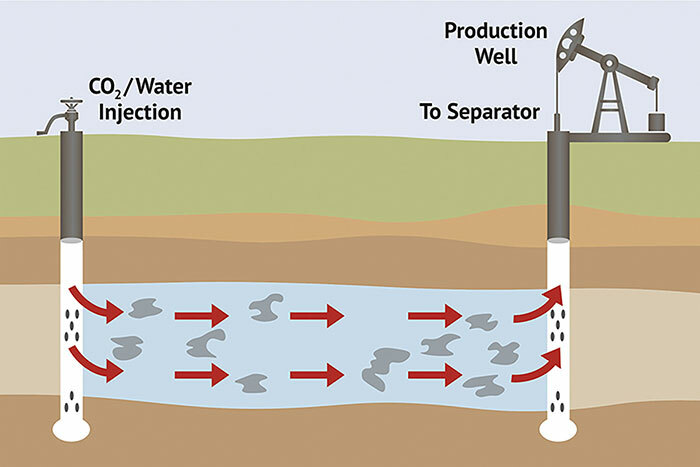 Water injected into a reservoir displaces oil deep in the reservoir and drives it toward production zones for extraction. Are Perceptions & Opportunities for EOR Changing? Even though chemical injection and EOR can increase oil recovery by as much as 75 percent, these methods have long been considered expensive, laborious and time-consuming. But that may be changing, in part to a shifting landscape and improvements made with pumping infrastructure.